A Record of its Struggles, Progress, and Success from its Inception in 1861 until the Year of its Jubilee, 1911 by Robert Murray, J.P. THE writing of a preface provides an author with a convenient opportunity to do several things which he regards as more or less important. It enables him to explain the plan he has adopted in the pages that are to follow; to apologise for shortcomings that he, probably more than any other, is conscious of; and to acknowledge his indebtedness to friends who have helped him with information or with words of encouragement and counsel. Under the first of these heads a few words seem necessary. In preparing this' historical sketch of the formation and development of Barrhead Co-operative Society the writer has kept steadily in view the purely local character of his commission. There was frequent temptation—particularly in the earlier chapters to widen the scope of the work into a consideration of industrial history in the century preceding the birth of Co-operation, and of the industrial conditions amid which the new movement was born. 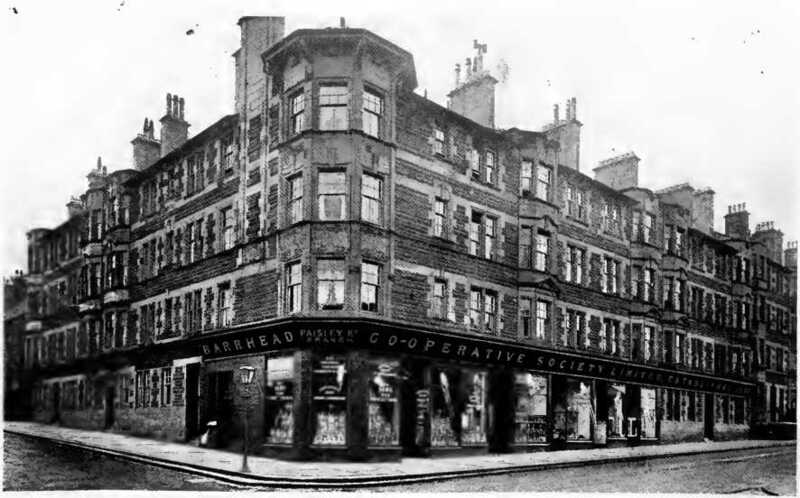 It would have been easy, and in some respects simpler, to have dipped into the wider Co-operative movement, and to have shown how great was the army in which Barrhead Society was a marching unit. But this temptation was successfully resisted, and there has been strict attention to the local propaganda and the local men, with no reference to the larger issues unless where such seemed essential. An effort has been made to present a clear and fairly definite picture of the Barrhead in which our fathers lived, and of the social conditions under which they did their pioneer work for Co-operation. The aim has been to record all the important steps of the Society’s development, and regret may be expressed that the need for keeping the book within reasonable limits has necessitated the exclusion of material for which the writer would fain have found space. As far as possible, every incident narrated and every fact asserted has been verified ; and the determination to use only what was unmistakable has caused the omission of not a few items that would have proved interesting, but the authenticity of which appeared to be doubtful. The task has been no light one, for it involved a great deal of burrowing amongst old records, and it entailed much interviewing of the yet remaining actors in the historical pageant which was to be depicted. It meant also the gathering together of a mass of material far beyond actual requirements, so that the most important and most interesting portions might be selected. Against this, however, is to be set down the fact that the work was of a congenial character, and brought with it a pleasure of a very deep kind. In particular, there has been a real and heartfelt satisfaction in being permitted to preserve, even in a fragmentary way, the memories of the able and devoted band of workers whose efforts created and sustained the young society. Apologies sometimes savour of the hypocritical; and, to avoid falling into this error, we will make no excuses beyond remarking that, whatever faults the critic may point to, will not, at anyrate, spring from carelessness or want of desire to present the story of our Society in a reliable and interesting fashion. It will he with the readers of the book to determine in how far the written record is worthy of the subject. In the matter of thanks it is impossible to indicate all those who deserve to be named. To Mr William Maxwell we are indebted for information and for a perusal of Mr M'Innes’s journal, the first Scottish Co-operator. Thanks are also due to Mr Mallace, of St Cuthbert's, Edinburgh; to Mr A. B. Weir, for assistance and advice; to Mr James Maxton, M.A., who kindly undertook the correction of the proofs; to Mr Thomas Dykes, to whom I am indebted for valuable assistance in the compilation of statistics; and, last, but not least, to the members of the Jubilee Committee, for their initial confidence in placing the task in the writer’s hands, and for their continued encouragement and kindness during the progress of the work. IT is not possible to compile a work of this character at present without being seriously affected and handicapped by war-time conditions. 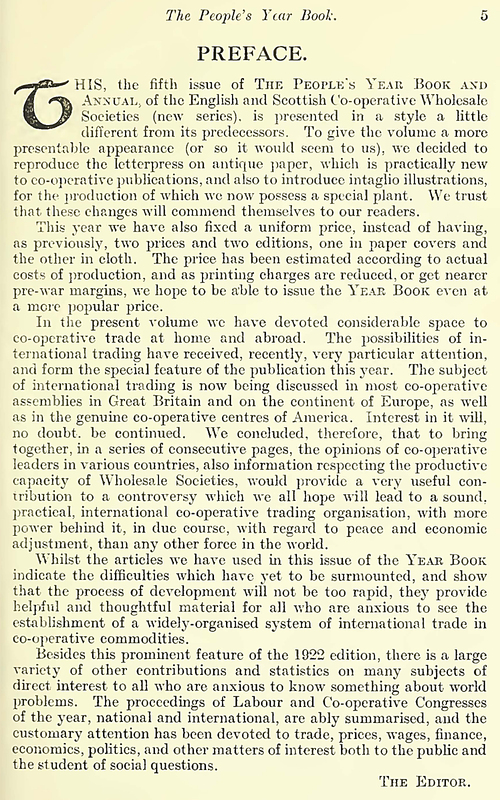 There are not the facilities there were prior to 1914 for obtaining up-to-date statistics, whilst many topical matters with which we should like to have dealt are now characterised by such frequent and rapid changes that they lose much of their use and value before they can be conveyed to the public through the medium of a year book. We have had, therefore, to omit features which would form a permanent asset to an annual volume like the one we now place before you, and hope to develop from year to year, especially as prices of printing materials approach a normal level. 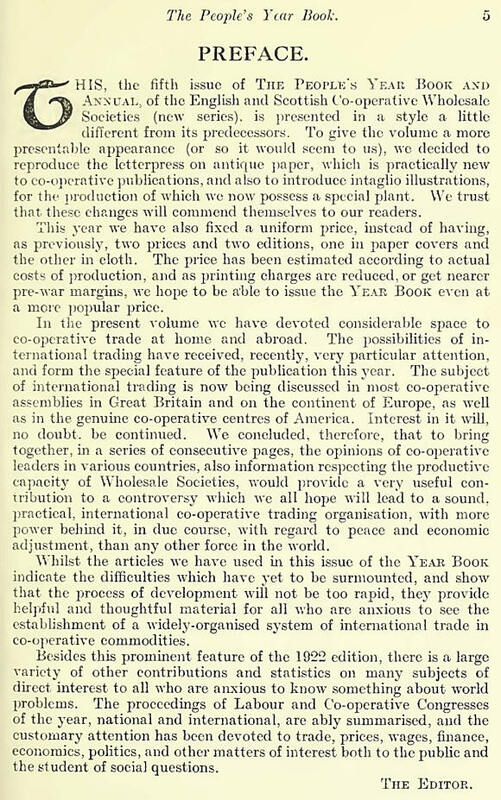 We have always felt that a year book of helpful and essential information on co-operative and allied subjects was needed, and in our first effort we have to regret several omissions which war-time circumstances and regulations have compelled us to make. We trust to remedy this defect, however, in future. 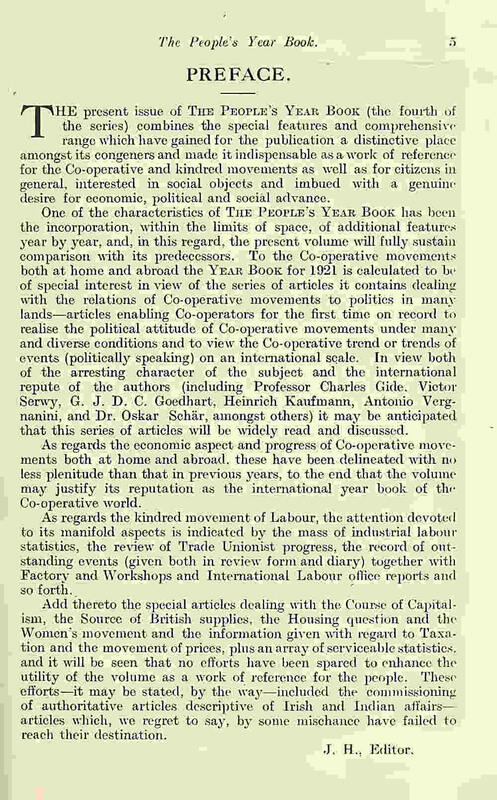 In our first year of publication we were anxious to give an intelligent, but not too ponderous, survey of the co-operative activities of Europe, also in countries outside the Continent, and, although we have had to make important erasions with regard to the historical growth of the co-operative idea at home and abroad, we present a compilation of facts and figures on world-wide co-operation which we do not remember having been done before so comprehensively. In view of the intercommunication between countries being at present difficult and unreliable, and impossible in some cases, this has entailed considerable research in foreign newspapers and periodicals, particularly with regard to up-to-date figures. But, whilst we have endeavoured (and hope to do more in subsequent editions) to provide information of a general style which may be useful to speakers, writers, members of public authorities and committees, also all seekers after facts, we have realised how much space could be occupied with the world activities of co-operation alone. The plan of co-operation that began at Rochdale has now extended and been established—in direct or modified forms—in nearly all the civilised nations of the earth, and a mere statistical annual record (bald and fleshless) would itself make up a very weighty and cumbersome volume. We have, nevertheless, varied our pages with series of figures and concrete descriptions touching social, political, economic, industrial, and domestic affairs. Figures dealing with wages, prices, capital, production, consumption, labour, trade unionism, and a host of other kindred matters, including the industrial battlefield and the field of sport, are also encompassed. We hope our compilation will meet with your approval as being informing and as a work of reference. For next year, to enlarge its usefulness, we shall welcome criticism and suggestions. THE establishment of national kitchens and restaurants is one of many measures so accordant with commonsense and public utility that the very idea of such in normal times was scouted as rankly Utopian and as altogether incompatible with the conditions of progress in the best of all possible worlds. In the general bouleversement of stereotyped ideas brought about by the war, however, the Utopianism of the pre-war period has become the practical politics for to-day, and probably for to-morrow and the day after. When Governments have so far descended from their Olympian altitudes as to provide us with daily bread, national tea and sugar, and standard clothing, and concern themselves with our rations of fuel and wants of all kinds, the circumstance may be regarded as an outward and visible sign of a far-reaching change of conception with regard to social affairs and to the relations of the State and to the nation at large. For years in succession the trend of events has been to impress the nation with the conception that the public welfare is the supreme law, and that the State is an essential factor in the promotion of the general weal: and whilst numerous institutions can only be justified as war-measures, others have shown themselves of such public utility as to ensure the probability of their permanence when peace-time comes round. National kitchens and restaurants may be said to rank in this category. In view of the success of the movement, due credit must be given to the late Lord Rhondda for adopting a good idea, and for establishing the National Kitchens Division of the Food Ministry and so setting the movement officially going and giving it a national status. 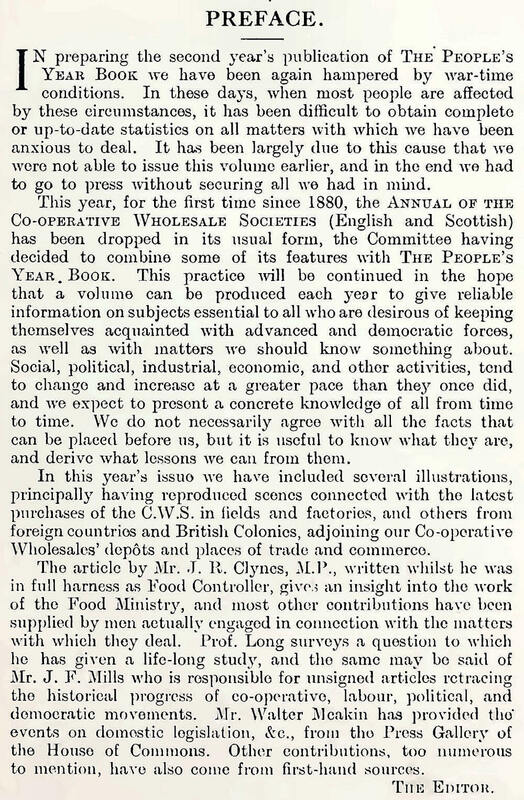 Since then we have had the Food Ministry carrying on a public campaign on behalf of Food Kitchens, where formerly it was members of the public who had to institute a campaign to secure attention to the possibilities realisable by the methods of public organisation. The Organisation and Aims of the Movement. Lord Rhondda believed in decentralisation. He believed in giving a local authority power to manage its own affairs. In regard to kitchens, power was given to all local authorities to establish and maintain kitchens, and authority was vested in them to delegate any of their powers to any committee that they might appoint. The Local Government Board were approached, and they also issued an Order to local authorities authorising them to use money from the rates if necessary for the establishment and maintenance of kitchens. Up to that point the position was perfectly clear Then came the question of the capital cost. The Treasury were approached several times and eventually granted two concessions. The second was very advantageous and was transmitted to all local authorities in the country. It was that the Ministry would advancte the total capital cost of the kitchens as a loan free of interest, to be repaid in equal annual instalments spread over ten years. The policy of the Ministry was then to bring home to the local authorities exactly what they should do. Steps were taken by letter, by circular, and b\ personal interview, to explain the details of the various Orders and the methods by which the Ministry considered the kitchens should bo run. It was laid down as a cardinal principal that the kitchens worn to be self-supporting and run as a business proposition, and there was to be no air or semblance of charity about them at all. The quality of the' food to be. supplied was one of the most important questions to lx< tackled; others worn to avoid the mistakes of the past, to avoid anything in the nature of glorified soup kitchens, and to avoid the faulty methods apparent in the German kitchens, where food is supplied in bulk, so that nothing short of starvation has driven the German people to the kitchens. Our idea was that everybody in this country was entitled to facilities for getting good food in national kitchens, regardless of tho individual's means, and that was one thing insisted noon in the training of cooks and supervisors who had to take charge of the kitchens. One of the ideas of the National Kitchens Committee was thal through the medium of the kitchens, if they were properly run, people—not only the customers, but also the numbers of small caterers throughout the country might be brought to see that it was possible to give people appetising and nourishing food at a price that would enable them to make a profit, and still be reasonable to tho customers. took up the standpoint that, them was no reason why the working-olasses should not lie better fed than they were now. The Ministry felt that it could be done, and by setting up some kitchens which worn run entirely by the department, they had proved that it can be done on a commercial basis of making a profit. They frequently received letters from different parts of the country saying that there was a great demand for national kitchens in that, particular area. If they had an official available they sent him down to-remind the local people of the powers which they had got, and did_ all they could to induce those people to put their powers into operation. But after all, the success of the development of the national kitchens as a business proposition depended entirely upon the public. 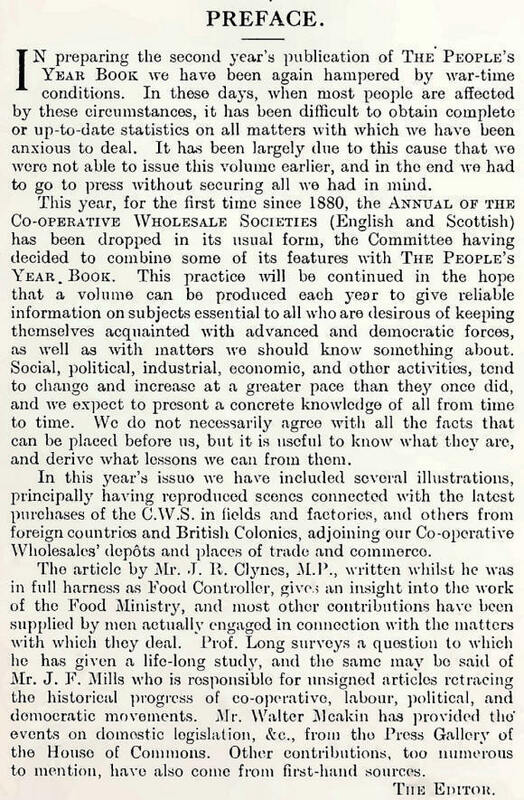 It was strong public opinion which enabled them to be started, and it was public opinion and action which would enable them to be run successfully after they were started, so that in the case of any particular trade or area where there was a distinct need for cooked food that was not at present available, the first step was to move the local authority. At the same time they were dealing with the local authority, they could deal with the Ministry. Soup, Id. per half-pint, and per pint, l½d. Cooked meat, entrees, patties, pies, puddings, or slices from the joint, half a coupon, 4d. and Patties, &c., 4d. each. Two tickets for half a coupon available on different days. Vegetarian dishes, 3d. per portion. Cup of tea and scones, 1d. Bread and butter, 1d. per slice. During the third week the number of persons served with meals reached 15,525; l\d. being the average receipt for each meal, while the cost worked out at a trifle under 6£d. after allowance for all charges—the resultant net profit being 1.1½d. per meal. The premises must be in a good position, and not in a back street, nor in a basement which necessitates descending many steps to arrive at the kitchen. The interior must be bright and attractive. The plant and equipment must be modem and efficient, and not a collection of old gas stoves. The cooks and the rest of the staff must bo suitably attired. The menu must be varied, and the food of the best quality, prepared by experienced cooks who can produce the best results in the most appetising and attractive form, regard being had at all times to nutritive values. Granting these conditions, it is possible for local authorities to seeure such benefits and advantages as a national profit in the saving of food and fuel, a municipal profit whieh may be applied in affording additional quantities of cooked food, a health profit in the provision of better food for the people, and an individual profit in the saving of time and money to the patron. The Growth of the Movement. Following on the London experiments, the plans of the Ministry of Food in September last embraced the establishment of national model restaurants in Birmingham, Bristol, Cardiff, Glasgow, Leeds, Manchester, Newcastle, and Brighton. And how far the movement had grown by that period is indicated by the official estimate of 623 kitchens and restaurants serving approximately a million portions of food per day, and by the fact of schemes for about 150 more having been approved or being in course of preparation, London coming at the head of a lengthy list with schemes for an additional 36, Yorkshire next with schemas for 20, and Nottinghamshire the third with plans for 22. All the same, circumstances clearly show that infinitely more might be done. When one considers the huge industrial areas in which no effort has yet been made, one realises once again the passive resistance to public enterprise characteristic of local authorities preponderantly representative of profiteering interests—a resistance which nothing can overcome but uncompromising pressure on the part of the public, in which connection it is clearly the duty of the local labour movement everywhere to give the public a lead. AS a tribute to his work for co-operation, nationally and internationally, Mr. William Maxwell was raised to the rank of knighthood on August 13th, 1919. For a generation Sir William has been one of the most familial figures in British co-operation, and for a long time has been well known in some of the co-operative centres on the Continent. He carries the honour with singular grace and dignity, but, having attained his seventy-eighth year, he is no longer as active in the great movement to which he has devoted his time and ability. During his remarkable co-operative career he has travelled widely, and sown the seeds of co-operation among people of other lands. Sir William was born in Glasgow in 1841, and comes of an old Scottish family who had been hardy tillers of the soil and, incidentally, fighters for their clan or cause. He served his time as a coach painter, having attained considerable technical skill by the time his apprenticeship had terminated. He was a workman of an artistic type, and had knocked about the British Isles before he began to settle down to co-operation in 1864. First, he became a member of St. Cuthbert’s Society, Edinburgh—in fact, more than a mere member; he was enthusiastic, and did a deal of propaganda. Before attaining the age of forty he was elected a director of the Scottish Co-operative Wholesale Society (in 18S0); nine months later he became the president, and maintained the confidence of Scottish co-operators in this leading position till his retirement in 1908. With a wide outlook, he devoted bis energy to the constructive work of the S.C.W.S., and was at the same time an eloquent advocate on the platform. Perhaps one of his greatest practical achievements was the advancement of the group of factories at Shieldhall. whence co-operative stores in Scotland are supplied with a variety of useful goods. He has been a great believer in the will of the people, and was one of the pioneers in the agitation to press co-operators to develop a political consciousness. He had a wide knowledge of the co-operative movement, for which his determination and sincerity never seemed to flag. He was a source of inspiration to younger men. To him-cooperation knew no barriers, and his breadth of mind and outlook fitted him admirably for the spread of the principle of co-operation internationally. 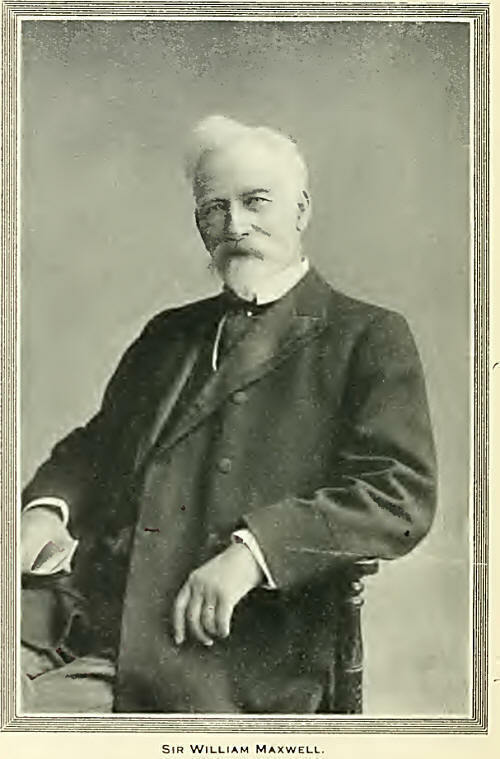 He was president of the congress of the International Go-operative Alliance at Cremona (1907). Hamburg (1910), and Glasgow (1913). He has been a member of the Executive Council of the I.C.A. since 1901, and his position as president of the Alliance has given him a distinct place in international co-operation, which he regards as one of the greatest peace forces in Europe.